Blanche DuBois always depended on the kindness of strangers. I am blessed with the fence painting of friends and neighbors. Love those flowers. I remember seeing them in the woods as a child, but they are a rarity now. Now you have a quest! They are so beautiful. My grandmother use to talk about them and the trilliums. Beautiful! I have never seen those before. Well I am glad to show them to you now! I think they grow in Wisconsin, too. They like to keep their feet wet, and to live in dappled shade. I love Lady Slippers too. My Mom used to look for lady slippers. I don’t think I’ve ever seen any in the wild. Though we don’t have all that much ‘wild’ down here. We have lots and lots of wild up here. We’ll share. Beautiful photo of the showy ladyslippers. One little spot we used to have many has been without them for a couple of years, but now they’re back. Another very secret place that had hundreds and hundreds has none this year. Mysterious! And certainly, DO NOT PICK! DO NOT DIG, EITHER!!!! Indeed. It is necessary to cover all the bases when it comes to protecting Showy Ladyslippers. 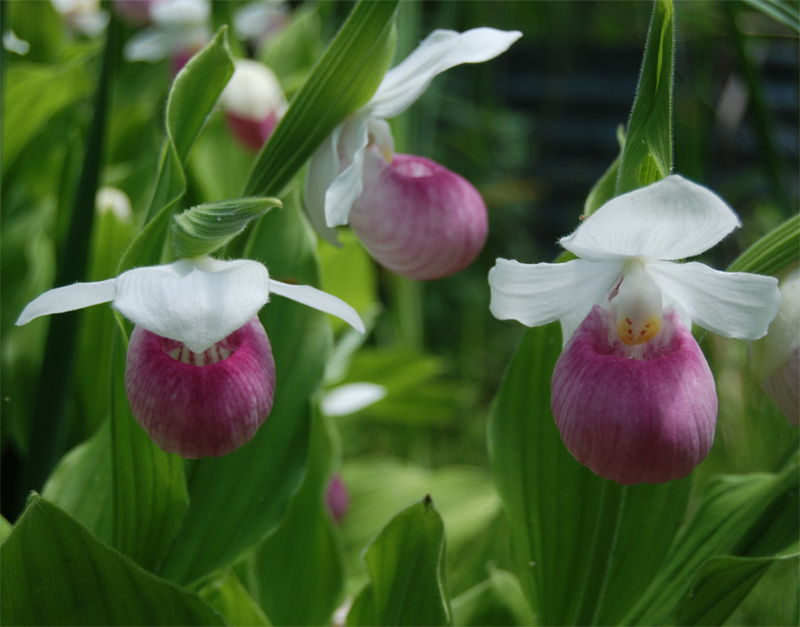 Some images of lady slippers were offered up this spring by a photographer from Montana. Were it not for those, this would have been my first glimpse. They’re well-named, and utterly beautiful. Thanks for sharing! I don’t know if it’s the flowers themselves or Katherine’s photography skills, but these appeal to me more than the ones that grow in my neck of the woods. Very striking image. Katherine did a fine job of capturing their lusciousness, but they are indeed luscious to begin with. They’re beautiful. I saw quite a few lady slippers while in Canada, the first time I’ve ever seen them other than in photographs. The wild Ladyslippers are rare and protected in Denmark, they are growing at only two places in the country. Protected or not, a few weeks ago someone stole 44 plants, which was 20 percent of the total numbers. 1 year in prison can be the price for doing such thing. Wonder how the other prisoners will think of a flower-criminal? Anyway the person has still not been found. The Danish name is Fruesko. Sometimes people seem to feel that what they want is the most important thing in the world. Assuming the Ladyslippers live at all, it will be 15 years before they are fully recovered. It would not go well for anyone who tried to uproot Torch Lake Ladyslippers, no indeed. Not well at all.